Shaved Summer Squash Salad with Lemon-Thyme Vinaigrette is a go-to summer salad! 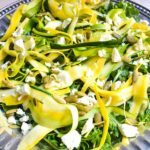 This salad recipe is a cinch to prepare, yet shaving the squash, adding creamy goat cheese and making your own vinaigrette really elevates this simple summer dish. Ready in ten minutes and no appliances needed! Add lemon juice, extra virgin olive oil, fresh thyme leaves, and Kosher salt to a Mason jar, shake and set aside. Shave outer portion of zucchini and yellow squash into long ribbons using Y-cut peeler. Reserve squash cores for another recipe. Toss the squash ribbons with lemon-thyme vinaigrette and set aside for approximately five minutes. Layer arugula on a flat platter. Next, add marinated squash ribbons. Add freshly crumbled goat cheese, sprinkle pumpkin seeds for crunch and serve! All nutritional values are approximate. This recipe is for approximately six small servings; adjust if serving as a main entree.